This fun-focused family trip will provide you as much of good stuff into 14 days as humanly possible - including tasting street food in Hanoi, cruising and kayaking on Halong bay, exploring the Hue citadel, Tra Que village in Hoi An, Cu Chi tunnels, boat trip on Mekong delta and admiring the wonderful world heritage Angkor Wat and Angkor Thom. Please remember to pack your smile, you will be needing it often on the tour. Admire the miracle Angkor complex with Ta Prohm temple, which was used as location in the film “Tomb Rider”.Educate your children about the diversity of life while experience how people live and work in floating Mighty Mekong Delta. Enjoy an eco-tour to learn about farming life of local people in Hoi An. Suite every member of your family with a wide range of activities in Halong Bay. Surprise your children with fascinating Water Puppet Show in Hanoi. A pleasant journey for your family to discover main attractions Vietnam and Cambodia. Warmly welcome at Noi Bai airport - Hanoi. Pick up and transfer to your hotel. If time permits, enjoy a walking tour around Hoan Kiem lake and attend water puppet show. In the evening, enjoy welcomed dinner at your local restaurant. Start your day with a visit to Bat Trang village - the most famous and long-standing pottery village in Vietnam. You will walk through the village, visiting different homes and observing the ceramic production process. At some workshops, your children can join in one process of making pottery. The product can be taken home as a souvenir. After lunch, explore Hanoi with the Temple of Literature, Vietnam’s first university for an overview about Hanoian culture and ancient Vietnamese architecture. Continue to the Ethnology Museum to learn more about the diversity in ethnic communities of Vietnam. Enjoy cyclo tour around Hoan Kiem lake before coming back to your hotel. At around 8 am, your driver will pick you up for the journey to Halong Bay and arrive at around midday to board a traditional junk for an overnight cruise. Halong Bay is widely considered to be one of the natural wonders of the world. Thousands of towering pillars of sea and wind-carved limestone karst make the bay an unforgettable sight. After lunch, explore some of the huge limestone caves dotted around the bay and visit a floating fishing village. Then the captain will find a secluded spot where you can swim, soak up the sun on the top deck, or try your hand at kayaking (The cruise itinerary may be changed due to the weather or operation). In the evening enjoy a seafood feast for dinner. After breakfast, leave Hue for Hoi An, crossing Hai Van Pass where you will have magnificent view of the sea. Stop at Lang Co to have break. Visit the fascinating Cham Museum and Marble Mountain en route to charming Hoi An. Upon arrival, you walk around this ancient town of 600-year old visiting the 200 year-old Tan Ky house, Phuc Kien Pagoda, the Assembly Hall, the former merchants’ houses, the 400 year-old Japanese Covered Bridge and the colorful riverside market. Today, you will have the experience of working and living with the local farmer in Tra Que village - one of famous vegetable village in Hoi An. You will cycle to the village with your guide. A short stroll will take you around the vegetable garden and then you can join the farmers in preparing the land and fertilizing it with seaweed from the local lake. Following steps are raking the ground, sowing, watering, picking vegetables and many other gardening activities. After all these activities, you will take a short rest and enjoy foot bath before getting to preparing lunch with a local family. Your lunch will consist of many local delicacies including ‘Tam Huu” spring roll, Banh xeo or local pancake of people in Vietnam middle region. You can join the cooking with the chef on these meals. After your morning excursions and your lunch, you will take a Vietnamese traditional post-prandial nap before learning how to harvest and wrap the vegetables. Around 14.00: bid farewell to your host family before riding back to your hotel. You have free time in Hoi An today for going shopping or relaxing on the beach. Leave Hoi An, you will catch morning flight to Saigon, Vietnam’s largest city has an exciting buzz as millions of people rush around on their daily business. The tour guide will pick you up at the airport and transfer to hotel. After a short rest, you will have a half day tour Saigon including The Reunification Palace, Notre Dame Cathedral and Old Post Office, Remnant War Museum and Ben Thanh market. After that, transfer to the airport for the short flight to Siem Reap. Upon arrival, transfer to your hotel for check in. In the later afternoon, enjoy sunset at Phnom Bakheng. Early morning, visit the picturesque Ta Prohm that had nearly disappeared into the jungle and remains overgrown, an oddly haunting and exotic scene. The magnificent roots of a tree, pushing between the huge stone blocks of the temple in a sort of embrace, evoke feelings that you may remember forever. And continue to visit the intricately carved Khmer ruins at Angkor Wat - one of the world’s most impressive ruins. The temple still owns fine Apsara carvings in Angkorian era art.. At 09am come back to hotel for breakfast and rest in the noon to avoid of the heats of the day until 15:00 continue exploring the mysterious Royal city Angkor Thom. Its 50-tower temple is an awesome sight. At first glance it seems a shapeless mass of stone, but further scrutiny reveals a face, and then another and another until suddenly you are engulfed by the silent, heavy, enigmatic and silent gaze through half-closed eyes, staring out from a primitive and remote time. Further, visit to the surroundings of the complex including the Baphou, Elephant Terraces, Lepper King Terrace and Royal Place area and visit one more ruin in Angkor Area of Preah Khan temple, built in 12th century by King Jayavarman VII and it is the same style to Ta Prom Temple. Transfer to your hotel in the later afternoon. You have free time until be transferred to the airport for your departure flight. End of the tour. Cảm ơn và chào tạm biệt. 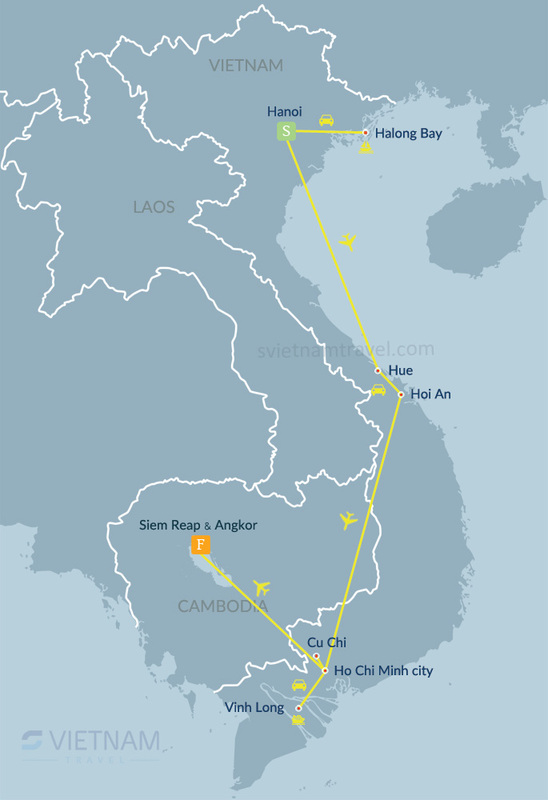 Flight tickets Hanoi - Hue, Danang - Saigon, Saigon - Siem Reap with Vietnam Airlines.